These pictures were taken during a commercial carpet cleaning in Tampa FL. 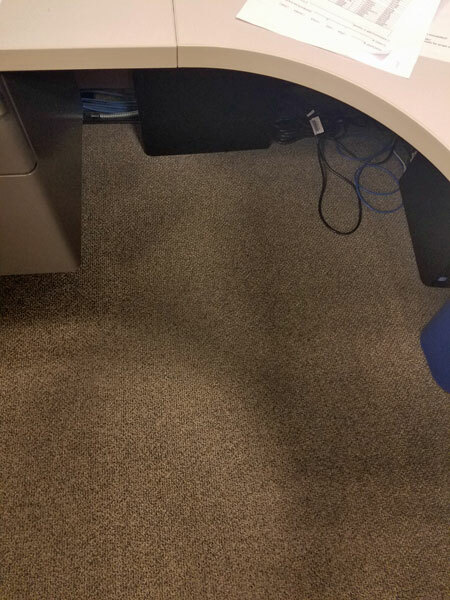 Using encapsulation cleaning technology Chem-Dry of Tampa FL was able to remove this tough coffee stain under a desk. 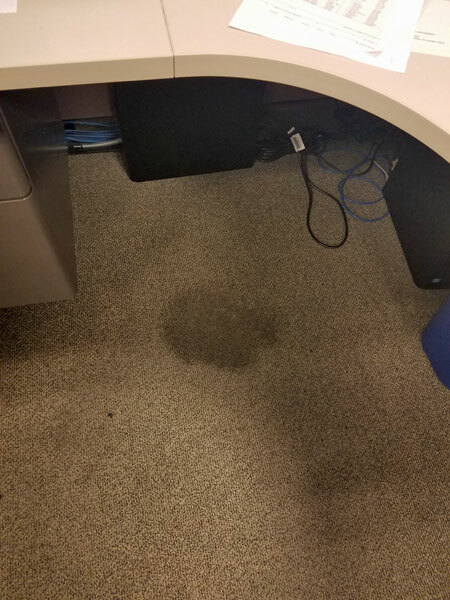 The stain had been lightly cleaned after the spill but the spot quickly returned. In some cases coffee spills can permanently stain the carpet, especially if they are not cleaned up right away. Using Chem-Dry's commercial carpet cleaning system, encapsulation, makes quick work of difficult stains and brightening the carpet as well. Encapsulation cleaning is perfect for commercial carpet cleaning applications because it is very low moisture and has very little impact on the working atmosphere. The encapsulation solution is sprayed into the carpet and then counter rotating brushes are used to dislodge the soil and dirt residue from the carpet fibers. Then a post vacuum completes the process. Leaving the carpet clean, dry, and ready for another day at the office. Encapsulation cleanings can be done several times a year but after 3 cleanings a deeper carpet cleaning system is used to get any remaining soils that have moved deeper into the carpet. That's when Chem-Dry's hot carbonated extraction is used to remove tough stains and layered soils. Hot carbonated extraction is also a low moisture cleaning system that is extremely powerful and dries within hours so that your business stays up and running, uninterrupted. There are a lot of choices for commercial carpet cleaning in Tampa FL but consider Chem-Dry of Tampa when your thinking of cleaning up your business. Our professional carpet technicians have years of experience dealing with tough to clean carpets. They have the solutions to take care of it.